Rather than explaining what Montessori is, I am offering an excerpt from an article that does a beautiful job of describing what Montessorians do. Maria Montessori's Decalogue is a set of 10 rules for adults working in a Montessori classroom. It is relevant to parents, grandparents, and caregivers of all types who strive to relate to children peacefully and respectfully in any environment. I hope you will enjoy this expanded version of the Montessori Decalogue as written by The Mammolina Children's Home Montessori Kindergarten in Beijing, China. 1. Never touch the child unless invited by him (in some way or another). Unless there is a very strong reason to (like avoiding an accident, for example), one should never touch a child unless a child requests it. Picking up a child without the child’s consent, even if in a playful manner, or grabbing her hand, pushing her, etc., should always be avoided. If children are engaged, looking at a book, working, playing, resting, the same principle applies. Children invite contact in many ways, and parents and adults in general, who work with children, know how to interpret the signs they send. It is important also to respect a child when she is angry and does not want to be touched or picked up. 2. Never speak ill of the child in his presence or absence. Speaking ill of a child, or making negative comments about a child, either in the child’s presence or absence, denotes lack of respect for the child. It also sets a frame of mind and denotes an attitude that is negative and conducive to confrontation—and not always open! Preconceived ideas often linger as negative thoughts and breed reactive behavior. If an adult falls into this trap, it is very easy for a lack of patience and negative attitudes to creep in and damage the relationship with the child. 3. Concentrate on strengthening and helping the development of what is good in the child, so that its presence may leave less and less space for what is negative. If adults focus on negative behavior, children will feel inadequate. This will result in low self-esteem, and a self-fulfilling prophecy like behavioral patterns will take over. Negativity will become second nature. Instead, by focusing on what is positive, the child will feel safe and confident. Children are learning what is and is not acceptable behavior can and cannot be done, etc. They do not need punishments or rewards. Simply to be shown what is and is not acceptable, by adults that model appropriate behavior. 4. Be proactive in preparing the environment, take meticulous and constant care of it. Help the child establish constructive relations with it. Show the proper place where the means of development are kept and demonstrate their proper use. If the child is presented with a prepared environment, there is little need for much more. Again, modeling appropriate behavior is essential. A child that is shown an orderly environment will likewise feel encouraged to keep it orderly. If a child has available manipulatives she can handle, play and work with, rather than things she cannot touch, she will feel at ease to explore the world around her. If objects are at reach, that the child may break or hurt herself with, she should be shown how to handle them, rather than told “don’t touch!” A kitchen is a world full of wonder for a child! 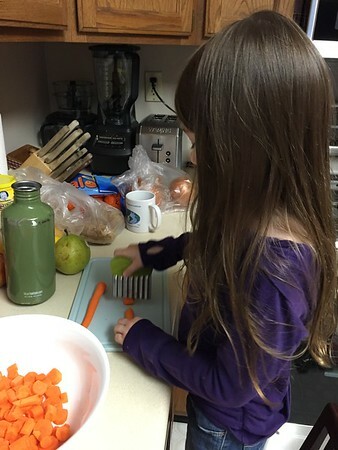 Cutting, cooking, stirring, pouring, etc., are all activities the child will want—and need!—to master in order to become independent. Include the child in as many activities as possible at home, from cleaning to cooking; there is enough to keep any child busy and engaged all day long. 5. Be ever ready to answer the call of the child who stands in need of you, and always listen and respond to the child who appeals to you. There is nothing worse for a child than to feel insecure and ignored. Abandonment is a feeling no child should have to live with. “If a child asks for attention, then that child needs attention,” stressed Montessorian Margaret Homfray. When people brush a child aside and say, “she just wants attention,” that person is missing the point: a child only wants attention when she needs attention. Children who feel cared for and do not have to worry about being abandoned, even if for a short time, are far more likely to care for others and show concern for and trust others, than those who experience this sort of “cold shoulder” treatment. Also, “timeout” and “go to your room and stay there” approaches are also expressions of abandonment. 6. Respect the child who makes a mistake and can then or later correct it herself, but stop firmly and immediately any misuse of the environment and any action which endangers the child, its own development or that of others. Avoid rushing to correct mistakes a child has committed. Children are learning to cope and function. They will persist and practice to their heart’s content whatever skill they need to acquire, until they master it. If a child starts throwing things around and disrespecting the environment, by all means, stop her. Yet, explain why you had to stop her. Reason and listen to what the child may have to say. Maria Montessori said that “a child’s first tantrums are the first ills of her soul.” There is always a reason for everything. Try to bring the reason to light. Punishing, isolating the child, etc., will only feed her pain, and burry deep those reasons—she will learn to hide rather than communicate. 7. Respect the child who takes a rest or watches others working or ponders over what she herself has done or will do. Neither call her nor force her to other forms of activity. A child that is idle is often not idle at all… Children need to be given space to find what it is they are interested in and want to do. Once they do, they pursue their interests with unrestrained passion and perseverance! A child that is observing other children or adults is also learning. If the child is resting, she is not being lazy and doing nothing just lying there—she is most probably processing information, observing, reflecting on something she did, or saw, or is planning on doing. 8. Help those who are in search of activity and cannot find it. Be sensitive to the needs of the child including differentiating when apparent inactivity is inner activity, or in contrast, a child is simply lost. A child in search of activity and unable to find it is usually restless. If sitting or lying down, it can be noticed that she is not “engaged;” she is not resting, but simply lost and prostrated. There is a thin line that separates these two worlds. It is the adult’s responsibility to observe carefully and find out the signs—often very different from child to child—that can reveal what the child is experiencing. Abandonment differs from rest and contemplation. 9. Be untiring in repeating presentations to the child who refused them earlier, in helping the child to acquire what is not yet her own and to overcome imperfections. Do this by animating the environment, with care, with purposive restraint and silence, with mild words and loving presence. Make your ready presence felt to the child who searches and hide from the child who has found. A child may need to be shown the right way to do something, say a word, express her feelings or acquire any sort of new skill, many, many times. One should never grow tired of repeating it, such as reading the same bedtime story or singing the same jingle. Children seek perfection in all they do until they reach a level which meets their needs (not what the adult may think “perfect” is, or means.) To be always available but not intrusive is an art. When a child needs help, she will ask for it. When a skill has been acquired and the child no longer needs assistance, adults should respect the child’s new acquired or reached level of independence. 10. Always treat the child with the best of good manners and offer her the best you have in yourself and at your disposal. Children who are respected will learn to respect others. Giving the child the best one has to give helps the child learn that you are someone she can count on, and teaches her to also give others the best she has to give. It is important the way Montessori puts it, “the best you have in yourself,” as if to say, always reach higher, but do not feel dismayed if you fall short, and “the best” that you can give is not the best you think or know you should give. If your best manners are not always what they should be—a common feeling parents harbor when children seem to be pushing their patience beyond the limits, do not lose heart. The way Dr. Montessori put it, is basically this: have realistic expectations towards the child, and yourself too. Give the best you have to give, but don’t feel guilty if you fall short. Simply keep striving to improve and always do your best. If you commit a mistake, giving the child your best may well be recognizing it and apologizing. “Amy, Mommy got upset and shouted. That was not nice of me. I am sorry.” Children also need to recognize mistakes, learn to apologize, and that parents are not always perfect. These are basic principles. What Montessori strives for is to protect the child from all sorts of negative influences that can create deviations in the child’s spirit and psyche. To preserve the natural curiosity of the child, help her find her interests, protect her passion for learning, foster it and let it grow in a healthy way. In this way, the child can contribute her best to society. This is conducive to world peace, as Dr. Montessori envisioned it, and Montessorians believe is possible. It takes passion, it takes commitment, and it takes working together. - Excerpted from Montessori: Committed People with a Passion for Children by the Mammolina Children's Home Montessori Kindergarten in Beijing, China. Guest Post: What is a "Montessori" Workplace Like? The Media Scape area of the Cummins Corporate Office Building in Columbus, Indiana. Photo by the Antal Building Corporation. - Thanks to Jennifer Tyrrell for this guest post. Jennifer is a Montessori teacher who worked in the Spruce Toddler class at MSGL from 2003 - 2005. One of the arguments I hear most often when I'm describing Montessori is that the open workspace—in particular the freedom to move around, to work where you do best for a specific task, and the ability to make a snack when you like—is not properly preparing children for the realities of life or the workforce: at some point they will have to learn to stay at their desk and do their work like everyone else. I think my husband's workplace shows the opposite to be true. My husband Jeremiah took the family to visit his "office" in Cummins’s COM building. Cummins is a well-known, large, international, Fortune 500 company that makes diesel engines, and they’ve recently built this COM building in their Columbus, Indiana, headquarters with a “collaborative workspace” design. They have converted several spaces in other buildings to this open style, as well. With this collaborative workspace, departments are located on the same floor, as much as possible. Though employees can work wherever they like on any floor, they are encouraged to work amongst their department's floor. A work area with sitting and standing work spaces in the Cummins Corporate Office Building. Photo by the Antal Building Corporation. He showed us his locker (hook and cubby) with a couple drawers for his personal items and work laptop (each employee is given one as their primary work tool), and a thin cabinet for his coat and outerwear. Then we walked around a huge floor with areas that have a variety of tables, some standing height, some for chairs; other areas with couches and coffee tables; other more intimate areas with armchairs and footstools (Jeremy's favorite). A couple of kitchenettes with long counters and stools (snack tables) are located centrally with no walls enclosing them. There are cabinets (shelves) that divide some places and contain files and materials for everyone to access. The kitchenette area in the Cummins Corporate Office Building. Photo by the Antal Building Corporation. Employees working on treadmills at the Cummins Corporate Office Building in Columbus, Indiana. AP Photo/The Republic, Joe Harpring. You can read a news article about more of the company's redesigned workspaces see additional photos, here. Jennifer Tyrrell is a Montessorian who has worked in public and private Montessori schools in Indiana and Wisconsin. She got her start in 2003 as an MSGL toddler assistant and is very thankful for that experience. MSGL is the strong benchmark by which all the other schools she has taught in are compared. She is currently living in southern Indiana, soaking up rural life in the woods with her two children, her husband, and soon, some chickens. This post was originally published on September 27, 2013. Families are drawn to Montessori schools for many different reasons. Sometimes parents are looking to continue in preschool the child-centered environment they have established at home. Others wish to see their children thrive in the our enriched classrooms. Still, other families choose Montessori preschools because they want their children to learn and socialize in a non-competitive environment. 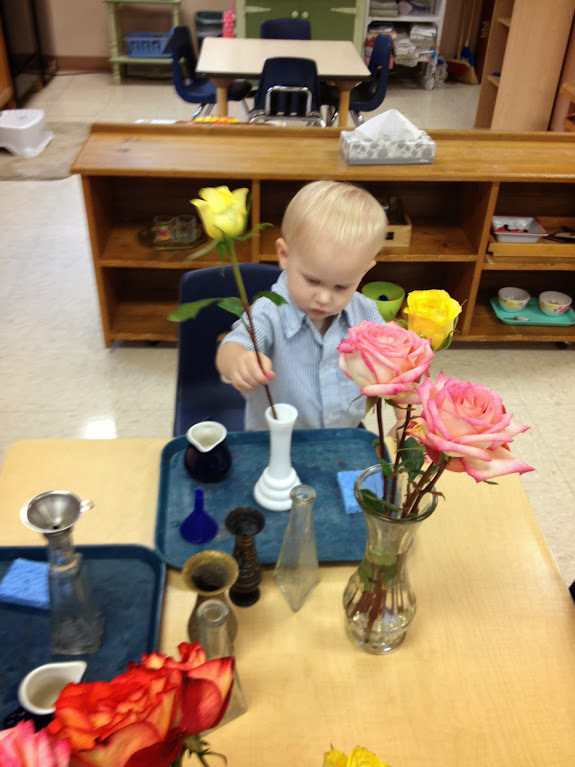 Whatever the reason parents choose Montessori, they often have many questions during their child's first year. To help answer these questions, MSGL offers a 1 ½-hour Montessori Basics class each Fall and all new families are expected to attend. Preprimary teacher Kelly Sallee presented this year’s class on September 25th to a packed house of over 40 parents and grandparents. Kelly focused her presentation on the Prepared Environment, the Sensitive Periods of a child's development, and the Role of the Teacher. If you were unable to attend this year's Basics, follow this link to read more about Kelly's presentation. Below are a few tips for new parents. Do your best to control the environment, not the child. Organize the child's belongings to help him be independent and successful. Don't worry if your child is unable to sit still or to focus for long periods. "Even when we feel they're not listening, they are learning." Speak to children at home in your native language. They will learn English at school. What's in your child's cubby does not necessarily reflect their work because many activities have no "paper" component. Look at classroom photos and videos on SmugMug to see what the children are working on in class. Your child's teacher will also have this information available for you at parent/teacher conferences. Give your child the gift of time. Try not to rush her through tasks. When a child is allowed to dress herself in the morning it may take longer but she will develop the skills necessary for independence. Allow your child to work without interruption, when possible. Periods of uninterrupted work strengthen a child's ability to concentrate for longer periods of time. Allow your child to complete tasks without correction. "I don't know any adults who walk around with their shoes on the wrong feet. They will figure it out with time." Give your child the opportunity to be a third-year student. Our mixed-age classrooms allow children to move from being the youngest who look up to role models to being the role models themselves. "Children who are the youngest in their families need the third year to be the leader that they don't get to be at home." It is important to say that you are your child's most important and influential teacher. You set the tone for your child's love of learning from the very start and it is you who bridges the gap between school and home. Sometimes this can feel overwhelming. 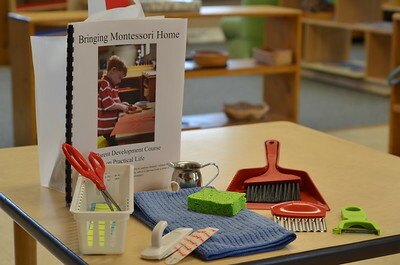 So please join us for "Bringing Montessori Home," a Parent Development Opportunity on Wednesday, October 9th from 6:30-8:00 pm. Kelly Sallee will be presenting ideas you can use and materials you can make to prepare a home environment that will nurture your child's independence. We hope you might also share how you use the Montessori philosophy to help your child be successful in your home. Register in the office or call or email info@msgl.org today! sign up in office or email Lena at info@msgl.org.